I just stumbled across a blast from the past. This is what affectionately became known as my "OCD Wallet"
I burnt 2 copies of each disc in case I wanted to mix a track that was on the same disc, also I had a backup should anything go wrong with one of the discs. haha...looks familiar. It almost caused me to shudder. I did basically the same thing, except it was pieces of paper in the slots instead of labels on the CDs with just an index code on the CD to figure out where the CD goes. I hated it. Going to a computer for organization for DJing made so much more sense....I'm not sure any argument I've heard even for vinyl beats the existence of playlists and arbitrary, instantaneous sorting for me even without all of the other additions. It did take a couple years to get over associating songs just with album art, but...it was worth it. 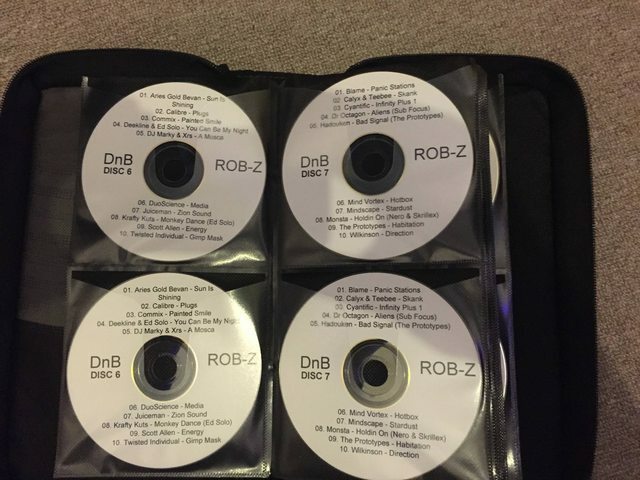 Every time some DJ starts bitching about the lack of CD option on XDJ/SC5000 line because he has a ton of CDs still in his collection and he's a "professional DJ" and so any gear without a option for CD playback is "not for professionals and won't be a club standard" all I can think about is: why the frack haven't you converted your CD collection into lossy/lossless format and joined the 21st? Also the main reason why I was suggesting for the past 5 years for beginners to skip the whole "buy a CDJ8000/1000 setup, it was a club standard and you'll learn beatmatching" phase and go straight to digital. It's just not worth it. Too much money, too much hastle. There definitely are high-level guys still using CDs. I saw Derrick May on vinyl + CDs a few months ago, and he killed it. So, it does happen. But, he's been doing it that way for a long time, and it works for him. I agree, I'm not sure there's a reason to start that way now except maybe as a backup for gigs that don't have current gear. In my personal music listening life, I've actually been buying CDs again, though. I've finally come around to mostly listening to albums the way the artist/producers intended rather than just shuffling a playlist and very much enjoyed it. But I don't think I'll ever DJ that way again. I think I'm gonna start buying CD's again. I really miss listening to a whole album from start to finish. When I do the studio upgrades later this year, I'm seriously considering picking up a dedicated cd player to run into my monitor controller. Ironically, this realization came the same week I found out Best Buy was going to stop selling CDs. Prediction: there's going to be an audiophile CD craze in a few years, probably related to different level normalization on streaming platforms. It is really weird if you're shuffling around something and some quiet, ambient ballad plays at the same volume as a Techno or Metal track. I'm starting to collect cds again. i don't know why, i just think they're neat. since i havent taken cds to the club ever in my life and most likely wont barring some bizarre throwback coming into fashion (the world is crazy these days, who knows), does anybody else collect in 2019? i'm interested in keeping mine organized and don't want to keep a bunch of binders around. i'm thinking of a few browsing bins near the table where my cd decks are (an "adequate" xdj r1). if you're curious about what i collect, i'm really into cd singles and cdr promos of 2000-2008 dance punk and electro, which is what i was playing digitally back when i was most active in parties. it's really fun to look back at physical media for this stuff since i mostly consumed it via blogs, turntable lab, and later beatport back then. I started purchasing CD's and keeping em in the wrapper of all the old CD's I wore out from listening to too much. Something about the Nostalgia of it. In middle school and high school, ya were always buying the latest album to keep up with the joneses so to speak.